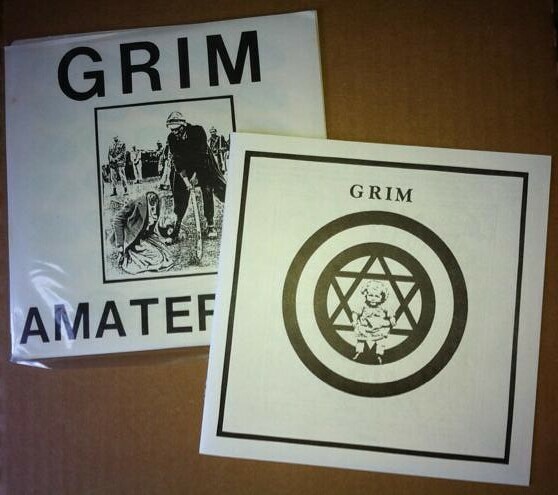 Unplayed original copies of the first Grim release, from 1985. Numbered (hand-stamped) edition of 1000, with a 12-page b&w booklet. Self-released by Jun Konagaya as the third release on his Eskimo label following the much sought-after LP and 7" by the legendary White Hospital (Konagaya and Tomo Kuwahara) from a year prior-- though the label here is confusingly also listed as G.A. Propaganda, actually just a one-off offshoot of Eskimo. This material was included on the recent Vinyl-on-Demand box set and the earlier CD compilation released on Haang Niap (run by mems. of Kito Mizukumi Rouber, Keiji Hainos Nijiumu project, etc). Konagaya plays "percussion, pulse, bass, organ, voice." "In Grim, Konagaya took the noise/junk techniques of industrial music as his core methodology, but what made his sound unique were the elements of ethnic music and folklore and the shamanic sensibility that oozed from within. In 1985 he released a three-track 7" single with the title Amaterasu, the sun goddess of ancient Japanese myth. The record was superlative, from the combination of metal percussion, feedback and electronic noise shrouding his roaring agit-prop vocalizations, to the way that the monstrous fairytale of the title track destroyed time and space." - from the liners to the "Folk Songs for An Obscure Race" comp on Haang Niap. "GRIM is an absolutely amazing, almost skizophrenic and obscure power-electronics and noise-one-man project of Jun Konagaya. Juns sound change its mood and athmosphere in seconds. From extreme harsh and hard power electronic noise-walls to ingenious folk-songs and tunes as you know it from Charles Manson. In the very early 80s Jun formed White Hospital together with Tomosada Kuwabara. They released one album called "Holocaust" in 1984 and split. At that time Jun had already released the "Vital“ Tape with his project GRIM. Kuwuhara moved on to form Vasilisk while Jun continued as GRIM releasing one Lp, 12" and 7“ as well as contributing to several compilations during the 80s." - Vinyl-on-Demand. "GRIM is Japanese legendary industrial noise bands of the 1980s created by Jun Konagaya. GRIM released one 7EP,one LP,one 12EP, and some compilation. Sound that not only harsh aggressiveness but also festivity, unknown ethnicity, prayer included. And, include mysterious, melancholic beautiful folk songs! CD reissue by Germanys Drag & Drop label in 1999. But, Its out of stock now. Haang niaps release is complete version includes every release track. It is not same as Drag & Drops CD. Include some amazing art works. Supervision by Jun Konagaya. This is an inheritance of surprising sound!! Factory-pressed CD in a gatefold mini-LP style card sleeve.with 12P booklet and OBI." - Haang Niap. "Devastating obscure industrial noise outfit GRIMs first new recordings from the 80s. Voice spelling spastic, sound aggressive for loudness but its also sensitive and stillness. The songs has many faces but doesnt change his point of view. Its realy apocalyptic. The new phase of GRIM is start from here." - Rockatansky. LP limited to 100 copies. "What Steinklang presents You here is the next REVOLUTION after the brilliant revival of Japans Ritual Industrial legend VASILISK. "Psycho Sun" is the first new album of Japans Noise-Pioneers GRIM since 27 years and their sound did not loose a single quantum of power in all those years! This is PURE GRIM, like three decades before! In the mid 80ies GRIM released three incredible milestones of Industrial Noise music, the LP "Folk Music", as well as the 7" "Amaterasu" and the more folky 12" "Message". These three releases always were and still are the "holy grail" amongst the most wanted collectors-items of this genre. Short history: GRIM as well as VASILISK developed out of the legendary Industrial duo WHITE HOSPITAL �(aka Jun Konagaya and Tomo Kuwahara). Both artists were mainly inactive over the last 25 years and now both felt� the sparkle to start again doing music, but not like most other "re-starters", who are just a pale shade from their earlier times - GRIM and VASILISK are doing the same fantastic music now, than they did in their early years!" - Steinklang. 2011 release. Limited edition of 600. "3LP-Box includes Vital K7, Amaterasu 7", Message 12", folk music LP, and various contributions. GRIM is an absolutely amazing, almost schizophrenic and obscure power-electronics and noise-one-man project of Jun Konagaya. Juns sound changes its mood and atmosphere in seconds. From extreme harsh and hard power electronic noise-walls to ingenious folk-songs and tunes as you know it from Charles Manson. In the very early 80s Jun formed White Hospital together with Tomosada Kuwabara. They released one album called Holocaust in 1984 and split. At that time Jun had already released the Vital tape with his project GRIM. Kuwuhara moved on to form Vasilisk while Jun continued as GRIM releasing one LP, 12" and 7" as well as contributing to several compilations during the 80s." - Vinyl-On-Demand.